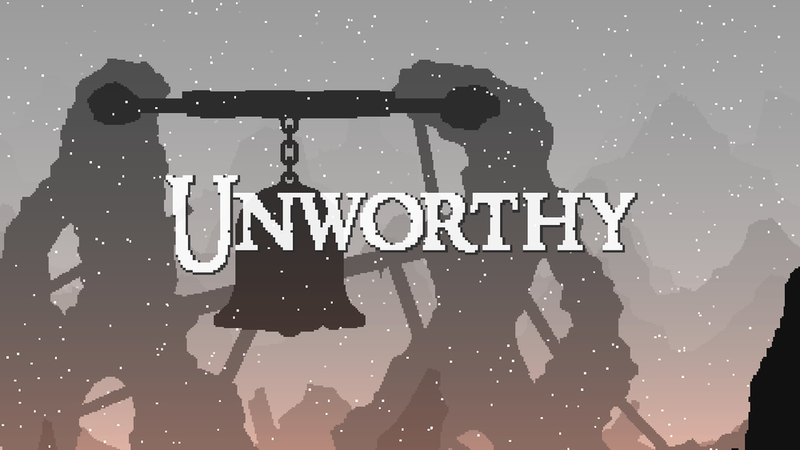 Unworthy is a minimalistic side-scroller heavily inspired by the Dark Souls series, featuring weighty combat, dodge roll with invulnerability frame, a respawn system and non-linear exploration. You play as an unnamed warrior risen from your grave and armed with a sword and a shield. After a very cryptic prologue, you start on an empty platform with not much instruction, and no explicit objective. The game does not even tell you to go about killing enemies or rescue the world. However, you can walk (but not jump) and you have a weapon - which almost all players would interpret as asking you to walk around killing enemies. The game gradually introduces branching paths - some open and some blocked by obstacles, chasms, locked doors and doors that only open from one side. Finding doors that cannot be opened are usually not fun, but most of the obstacles and chasms can be overcome by acquiring weapons that possess special moves. For example, hammer can clear rubbles, and fireballs can burn away tree trunks. There is also a bow that teleports you to where your arrow lands - which is very interesting but can be frustrating when you are required to fire it blind. Combat is dark-souls-inspired, and is slow (some might say too slow) and weighty. While one can block-and-punish, side-step or parry in Dark Souls, there is a much higher emphasis on dodge rolling in Unworthy. There are only a few weapons to choose from throughout the game, and shield is only available if your main weapon is the sword. And even then, there is no way for the player to USE the shield - it only get used automatically when it is not on cooldown. The main way to avoid damage is therefore either offense or, more often, dodge roll again and again - given you have enough stamina. That said, boss fights are the highlights of the game. They range from easy to somewhat unfair, but most of them require you to analyse their movement and attack, finding out their weak points, and execute on your plan - rather than brute forcing them. Like in the Dark Souls series, one can be easily defeated by a boss if one does not pick the correct time to attack, and the choice of weapons - although limited - gives a bit of variety to the fights. 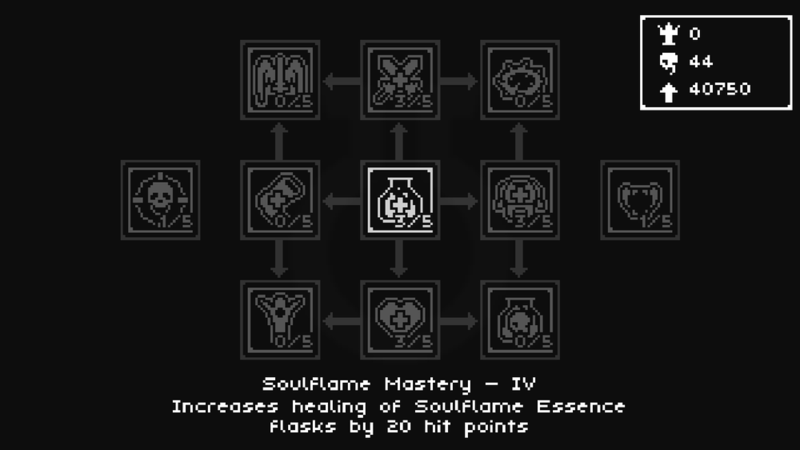 On top of weapons, hit point and attack power (the latter 2 come from gaining XP and levelling up), there is also a system of runes and a skill tree. The skill tree mostly provide stats boost (e.g. higher HP or attack) but advancement can only be made after you kill a boss or found a special item. On the other hand, runes are much more interesting and varied. You can equip up to 5 runes at a time, and their effects range from “30% damage increase but removes HUD” to “immune to Toxic” to “convert all but 1 HP to attack”. Unworthy is very much a 2-D souls-like (in the sense that it has Dark-souls-like combat, healing and respawn system), but has much more open world-design and utility-gated exploration - making it a proper metroidvania game. If you enjoy exploring and do not mind the slow combat and reliance on dodge-roll, you may very well enjoy your time with Unworthy.